There are a couple of odd things about the area on the Mississippi River called the Quad Cities. One is that it isn’t made up of four cities but five — Rock Island, Moline and East Moline (Ill.) and Davenport and Bettendorf (Iowa) — plus several satellite communities on both shores. Another oddity is that the river here does not flow north and south rather but east to west. 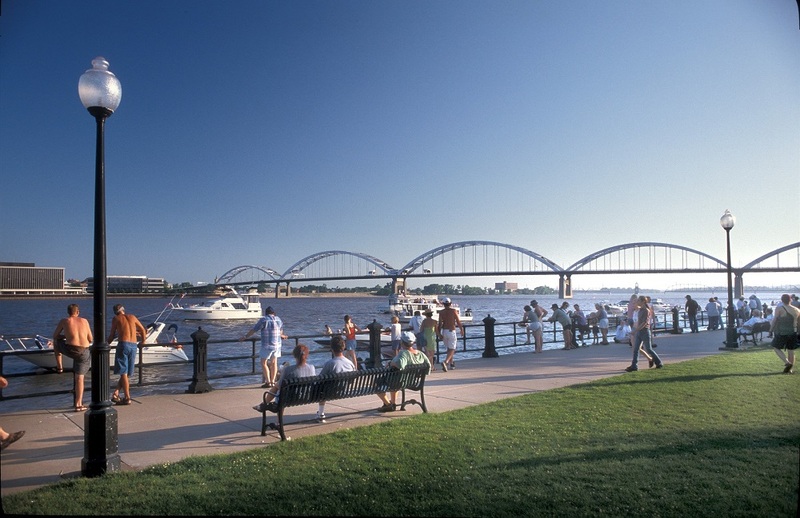 Located midway on the Upper Mississippi, the Quad Cities have a combined population of about 400,000. 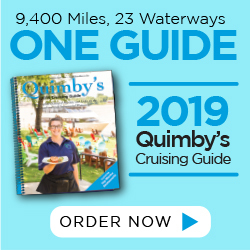 The area stretches for approximately 10 miles upstream from Rock Island on the Illinois side, past Moline and East Moline, and on the Iowa side from Davenport to Bettendorf. In that 10 miles are four marinas, numerous launch ramps, a couple of courtesy docks and four riverfront restaurants. In other words, plenty of access and amenities for the boating tourist. The Rock Island riverfront sits mostly below Lock and Dam 15, which happens to be the largest roller dam in the world. This same dam creates two separate areas across the river in Davenport, as part of the riverfront lies below the dam and part above it. There are numerous parks and green spaces on both shores. Coming into the Quad Cities from downstream, the first facility is Sunset Marina in Rock Island, at Mile 479.8 on the Mississippi River. It sits off the channel in protected Lake Potter. Because this is a calm, no-wake area, the river current is not an issue and the two launch ramps here are very popular. Transient fees are $1 a foot, and while calling ahead is advised, late arrivals can just go to the gas dock. Sunset Marina has no food or lodging on site, but downtown Rock Island is less than 2 miles away. Known locally as “The District,” the downtown area has a lively nighttime scene and holds numerous annual events and festivals. One way to get there is via a walking/bike path called the Great River Trail, which eventually runs 62 miles north to Savanna, Ill., passing through the Moline and East Moline riverfronts. About 2 miles further upstream is the Centennial Bridge, a beautiful sight when lit at night. On the Illinois side are the Rock Island Schwiebert Park Docks, with seven slips that provide access to the park. The docks are free but only open until 10 p.m.
Across the bridge in Davenport is Modern Woodman Park, featuring a 105-foot-tall Ferris wheel that’s painted red, white and blue. A ballpark here is home to the River Bandits, a Houston Astros Midwest League affiliate. The river vistas from the stands are so good it has been voted best views from over 100 minor league teams. Just downstream is the 250-acre Centennial Park, which has a boat ramp, rugby fields, an off-leash dog area and a skate park adjacent to it. Upstream is the 400-acre LeClaire Park and Bandshell. The park is referred to as “Davenport’s front yard” and is the site of numerous events like the Mississippi Valley Blues Fest and the Quad City Bank and Trust Riverfront Pops concert. Boaters anchor offshore for those, as well as for the July fireworks. Anchoring can be tricky, so patience is advised. Passing through Lock and Dam 15, Mile 482.9, is fairly quick for recreational boaters because it uses an auxiliary lock that eliminates long waits at the main chamber. Lock tenders monitor channel 14 while tows use channel 13. The Rock Island Arsenal sits on the Illinois side and has the oldest golf course in the area, with several holes along the river. Both the course and the restaurant are open to the public. Slightly upstream and across the river along the Davenport seawall is the Driftwood Pub with its outside patio. Catfish nuggets and fish tacos are lunchtime favorites, as are the walleye and prime rib special nights. Although there are no docks, boaters can stay just upstream at the Lindsay Park Yacht Club at Mile 484. The yacht club marina and restaurant sit behind a seawall that offers protection. One of the oldest yacht clubs on the Mississippi, it is private but accepts transients and allows them to use the bar and restaurant. Slip fees are $1.25 a foot at their courtesy dock, and covered slips are occasionally available. Downtown hotels are a bit less than 2 miles away, and the yacht club also has the advantage of being across the street from the East Village, a historic area of unique shops with unusual gifts and bars and restaurants. On the upstream end of the yacht club is a docking area for the Channel Cat Water Taxi. This open-air, bike-friendly taxi docks at four locations, two in Iowa and two on the Illinois side. An $8 ticket for adults and $4 for children is good for all day rides, so you can get off, wander around, get back on, then repeat the process at the next stop. The bike option is handy for those who want to ride the trails on both sides of the river. Including off-river trails, there are about 100 miles of surfaced trails for bikers. Rentals are available. Just below the I-74 bridge is Bettendorf’s Leach Park and boat ramp. Across the river is John Deere Commons, an entertainment district in Moline off the channel in what is called Sylvan Slough at Mile 486.3. Enter the cut there and then turn back downstream. You’ll go under a bridge and past the Sylvan Slough Boathouse of Y Quad Cities Rowing. Just past that are the day-use docks at John Deere Commons, next to TGI Fridays and its outside patio. This dock is also a Channel Cat stop. From there, you can explore downtown Moline, attend an event at the iWireless Center or wander through the John Deere Pavilion. John Deere’s headquarters are in Moline, and its interactive pavilion showcases both its history and its current innovations. Kids of all ages love to climb on the machinery, large and small, old and new that is housed there. Just above the I-74 bridge is the Isle of Capri Marina and Hotel, Mile 486.2. Originally, there was a gambling boat there, but it, like the ones in Davenport and Rock Island, are gone and are now land-based casinos. The marina and hotel remain; the marina has a snack bar and is walking distance to services in Bettendorf. The hotel has four different restaurants, ranging from upscale to sports bar food. Slip fees are $15 Sunday through Thursday and $25 on weekends and holidays. At times, the current here can make maneuvering difficult. There is another Channel Cat dock here. Proceeding upstream, you pass along the Ben Butterworth Parkway, a 2.2-mile urban trail with playgrounds and two launch ramps. You also pass the Celebration Pier with its Channel Cat dock and the Celebration Belle. This 750-passenger paddlewheeler has a cruise schedule that offers different distances and themes. At Mile 488.2 is Marquis Harbor and the Captain’s Table Restaurant, owned and operated by American Marine. The harbor sits behind a seawall, and slip fees are $10 a foot. The favorites at the Captain’s Table are steaks and seafood — and its Sunday night open-air concerts. Like other locations in the Quad Cities, if you sit on the patio here at certain times of the year and look to your left, the sun sets directly over the river. Less than a half-mile upstream, the lateral dam ends and you can rejoin the main channel. Off the river, you will find a wide variety of places to go, things to see and do, and events to experience. There are multiple museums for both adults and children, including one called the River Music Experience. There is the Quad Cities Botanical Center, art districts, numerous street fests, three casinos, downtown hotels, diverse restaurants, lively nightlife, and a multitude of brew pubs and live music venues. There is even a resident professional ballet company. Summer events are held all over the Quad Cities. One of the bigger ones is the Quad-City Times Bix 7 in July, a top 10 running event in the U.S. Another July favorite is the John Deere Classic PGA event at the TPC Deere Run golf course. Golf enthusiasts have their pick of 25 courses in close proximity, with green fees that average $35 with a cart. Another popular one is the Bix Beiderbecke Memorial Jazz Festival in August that highlights its namesake’s jazz music and the Dixieland style. Race fans can watch the Quad Cities Kwik Star Criterium over Memorial Day where over 650 cyclists race through the streets of the East Village. June events include a local tradition, the Father’s Day Ride the River event. Bike-riding families cross back and forth across the river to ride the riverfront trails. Other big ones are Gumbo Ya-Ya and the Mississippi Valley Blues Fest, at the end of June and the beginning of July, respectively. One of July’s highlights is Red, White and Boom, a spectacular fireworks display over the river. Crowds line both shores, while many more watch from higher up on the bluffs on both sides of the river. Anchored boaters get a front row seat for the sight-and-sound spectacle. August brings the Caribbean-themed Ya Maka My Weekend and Floatzilla, the largest paddlesport event on the Mississippi. Among September’s offerings is Brew Ha Ha in LeClaire Park, which celebrates a wide variety of brewers with over 100 free samples. The Xstream Rock Island Grand Prix, held downtown, features go-cart racers from around the country. The iconic Mississippi River has long been a popular cruising choice. The Quad Cities has a lot to offer as either part of that longer river trip, or as a destination itself. Two good sources for boating information about the Quad Cities area are the Upper Mississippi River Charts (www.agc.army.mil/Missions/Echarts/InlandChartBooks.aspx) and Quimby’s Cruising Guide (heartlandboating.com/store/). For more information on general tourism, visit visitquadcities.com.